LEGO Star Wars: The Freemaker Adventures is an original story. Unlike other LEGO Star Wars shows, which are more like parodies (albeit hilarious, clever parodies) LEGO Star Wars: The Freemaker Adventures is an original story that features original characters. The overarching story of season one involved the search for the Kyber-Saber Crystal, an ultimate-weapon that Rowan Freemaker has a special connection to. But Emperor Palpatine wants all that evil for himself so peril, daring, and hijinks ensue. This story is truly original, yet feels authentically Star Wars at the same time. It finds the perfect balance of feeling, action and humor. LEGO Star Wars: The Freemaker Adventures manages to portray new characters that are sure to find their way into your heart as well as your tickle funny bone. I quickly attached myself to the Freemaker family, and there are a few scenes in which I may have shed a tear or two. There were countless scenes that had me laughing so hard I was crying as well. The show also has guest appearances by many characters (and other elements) recognizable from other areas of Star Wars including the films, The Clone Wars, and Star Wars Rebels. You'll see Lando, Luke, Leia, Hondo, and Maz...and that is just naming a few! LEGO Star Wars: The Freemaker Adventures is set between Empire Strikes Back and Return of the Jedi, a time that hasn't seen much focus storytelling-wise. (And before you ask, no, this show isn't canon- it's "canon adjacent" and the meaning of that term that could be an article in and of itself. But there isn't anything contradictory to canon in this show, and frankly, the storytelling is so good, you won't really care about canonical content when watching.) It's fun to explore a different part of the timeline. Also, the show airs this summer, when we are still eagerly waiting for the final season of Star Wars Rebels this fall and The Last Jedi in December, you can catch new LEGO Star Wars: The Freemaker Adventures content this summer. Four new shorts aired May 4th and season two starts soon! I can't really articulate how funny this show is. Every episode had numerous laugh out loud moments for myself and my kids. Do you miss battle droid humor from The Clone Wars? This show has it. Did you love the irreverent take on the relationship between Palpatine and Vader seen in previous LEGO Star Wars shows? This has it. Podracing humor? Check. Hondo just being Hondo? It has that too. Plus family squabbles, Hutt humor, and bounty hunters that aren't the brightest crayons in the box. If this show doesn't make you laugh, I don't know what will. LEGO Star Wars: The Freemaker Adventures uses the fundamental building blocks (see what I did there?) of Star Wars storytelling and introduces viewers that may not be familiar with Star Wars to the foundational components of a galaxy far, far away. It is apparent that the creators of the show Bill Motz and Bob Roth truly love all of Star Wars. LEGO Star Wars: The Freemaker Adventures draws in characters, elements, and themes from all eras of the saga. No matter what era of Star Wars you love, be it Original Trilogy or the Prequel Trilogy; other LEGO Star Wars or animation; there will be callbacks and tidbits that will resonate with you. Season Two of LEGO Star Wars: The Freemaker Adventures will air this summer. If you haven't watched it, I hope you'll give it a try. 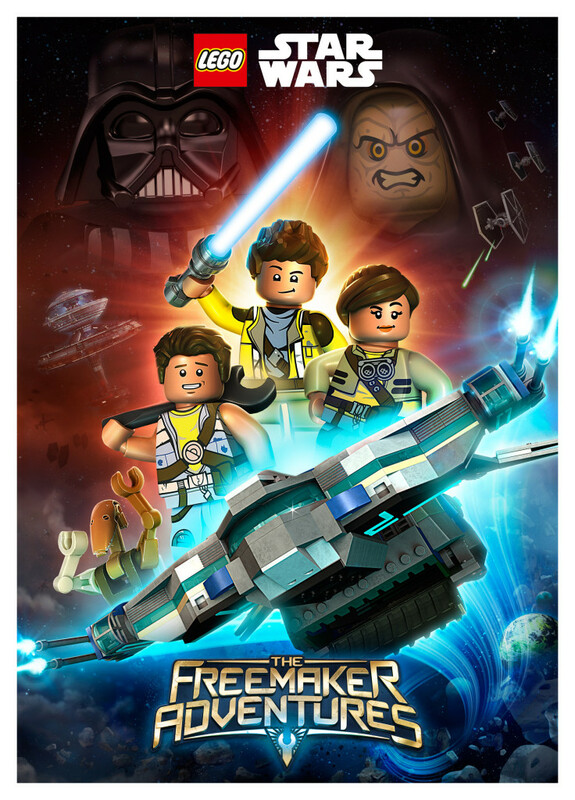 Have you tried LEGO Star Wars: The Freemaker Adventures? Can't get enough? Have you checked out Star Scavengers? Star Scavengers is a podcast that focuses on LEGO Star Wars: The Freemaker Adventures and is hosted by Johnamarie Macias and Aaron Goins. They have episode reviews and interviews with the creative minds involved with the show. Find them here: http://www.starscavengers.com. May the Force of the Freemakers be with you!